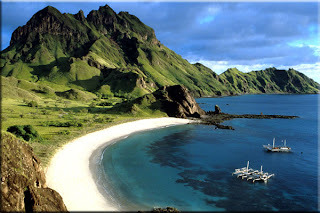 Komodo Island is an island located in the Nusa Tenggara Islands. Komodo Island is known as a habitat for animals native Komodo dragon. The island is also the Komodo National Park which is managed by the Central Government. Komodo Island in the eastern island of Sumbawa, which are separated by the Sape Strait. On the island of Komodo dragons animals live and breed well. 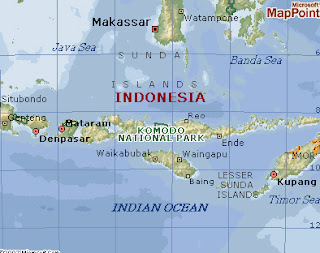 Until August 2009, on the island there are about 1,300 Komodo dragons tail. Coupled with other islands, like the island of Rinca and Gili and Motang, their numbers totaled about 2500 tails. 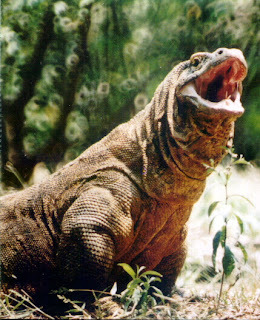 There are also approximately 100 individuals dragons Wae Wuul Nature Reserve on the mainland island of Flores, but not including the Komodo National Park. Besides Komodo, the island is also storing a variety of exotic flora that Sepang wood by local people used as a medicine and dye clothes, nitak tree Sterculia oblongata in this or believe to be useful as medicines and seeds are tasty and delicious like peas. To get to the island of Komodo, only passable sea route by using the ferry from Labuan Bajo (Flores) or from Sape (Sumbawa). Travel time from Labuanbajo to Loh Liang, post purchase tickets on Komodo Island for about four hours using a wooden motor boat with rental costs between Rp 600 thousand to $ 1.5 million per day. While the speedboat just about two hours, but the rent is much more expensive at around Rp 3 million. If the target is heading once Loh Buaya on Rinca Island entrance, the rent is cheaper because of the distance is closer Labuanbajo. BajoUntuk reach Labuan Labuan Bajo, can use the ship Pelni KM. Tilongkabila and KM. Wilis from the port of Surabaya with a ticket price of Rp 260 thousand for economy class and $ 823 thousand for the second class or a price of USD 184 thousand and $ 578 thousand if the port of Benoa Bali. While the aircraft can use the Lion Air flight from Jakarta or if from Bali (Denpasar) to the Indonesian Air Transport (IAT), Merpati and Air Trigana. Admission price of Komodo National Park U.S. $ 15 for foreign tourists and $ 75 thousand for the period of validity of the local tourist ticket for three days.